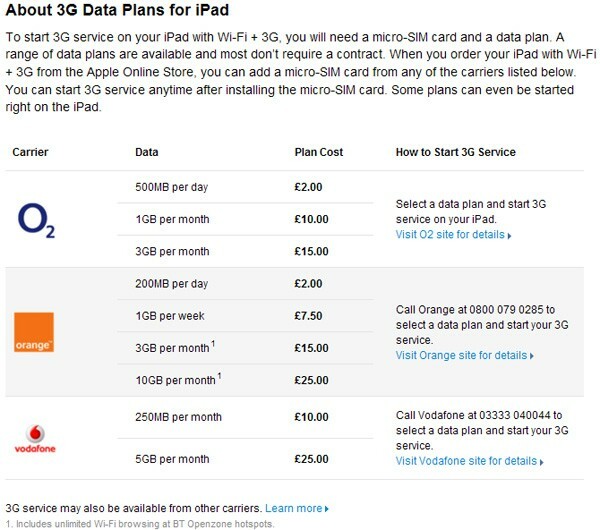 With international pre-orders now being taken, more data plan details have started emerging for Apple's iPad. We now know that Rogers will be charging Canadians pretty similarly to how AT&T treats American 3G users, albeit with the inclusion of a 5GB monthly data cap on the pricier tariff. O2 has also outed its plans, though it's not much better news in the UK where it's matching Orange's pricing with a 3GB monthly allowance for £15 per month ($22), while Vodafone has completely lost its marbles with a 250MB offers a 1GB option costing £10 a month and 5GB costing £25 per month. Apple engages in a bit of false advertising in Germany, claiming unlimited data plans with O2 (€25) and Vodafone (€29.95), but there are clear limits set out on the carriers' sites of 5GB and 3GB per month, respectively. 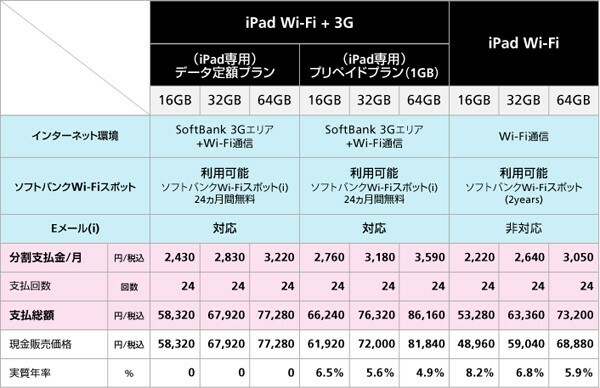 Finally, Japan gets the stiffest deal of all with iPads there officially confirmed to be SIM-locked to Softbank Mobile's network, something that has already earned plenty of ire from the local populace. The carrier does offer a variety of monthly payment plans for obtaining your tablet, though its data tariffs are nothing special: ¥2,910 ($32) for a month's unlimited use if you sign up to what seems like a longer-term plan, or ¥4,410 ($48) for a 1GB allowance if you go pre-paid. There's a third option for spendthrifts, costing ¥1,510 ($16) for 100MB pre-paid, but that's not even enough for you to watch a full Engadget Show, so we'd probably advise against it. You can find price breakdowns for each country after the break. Update: Rogers has killed that lovely third option shown in the image above. Hope you weren't excited about it. Update 3: Movistar, Telefonica's consumer arm in Spain, has announced a pretty stonking deal: if you already have a smartphone data plan costing €25 a month, you can get a Micro SIM and 3G data on your iPad for free. Espana totally just won the "best place to own an iPad" contest.